Our pages on Negotiation Skills explain What is Negotiation? and show how negotiation works in action. We also provide some information about avoiding misunderstandings in negotiation. This page explains how negotiation skills can be applied to peer-to-peer situations. In a peer-to-peer situation, the negotiation is happening between two equals, or peers. The term ‘peer negotiation’ is often used to describe formal work with adolescents, helping them to resolve disagreements. However, the same skills apply to adults working on an informal basis, where you may not even think of the situation as a negotiation. You may require this kind of skill, for example, if you are a member of a committee of a voluntary association, or to resolve a workplace disagreement. Peer negotiation is probably best thought of as an extension of peer mediation, a technique used in a number of schools and similar settings to help people to resolve conflicts and problems without resorting to ‘authority’. Peer mediation encourages trained ‘peer mediators’ to help resolve conflict between young people. It has been successfully used in a number of US schools, and helps young people to improve their conflict resolution skills. Children and young people involved in, or supported by, peer mediation programmes report improved self-esteem, listening and critical thinking skills, and a better climate for learning. Peer negotiation is perhaps best considered as ‘do-it-yourself peer mediation’. In other words, instead of having trained mediators, everyone is responsible for their own mediation and conflict resolution. The staff of children’s residential houses in West Lothian wanted a new approach to reduce conflict between young people. Working with Peer Mediation Network: Scotland, they trained staff and young people to use a peer negotiation approach to resolve conflicts. The programme resulted in reduced police call-outs, and far less physical restraint. Perhaps more importantly, the young people felt that they were more confident in challenging unfairness assertively, and in accepting challenges. They had also learnt to negotiate more effectively with staff, providing them with long-term communication skills. A desire to find a win-win solution. The case study from West Lothian was particularly notable for the fact that the parts of the programme that were considered most successful were those that succeeded in engaging the young people and supporting them to take responsibility for the programme. Those involved particularly liked providing refresher training for staff, and supporting new residents to develop their peer negotiation skills. They enjoyed having a chance to take responsibility. In other words, peer negotiation requires a willingness to engage and look for solutions together: it is all about collaboration. 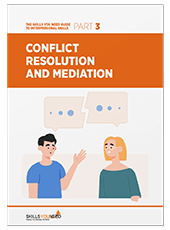 Our page on Conflict Resolution sets out that collaboration emerges from high levels of concern about both self and others. It is not the same as compromise, where both parties give something up. Instead, it is about finding a shared route to success, where both sides ‘win’. Successful peer negotiation requires a range of communication and personal skills. Strong self-esteem, to ensure that you value yourself. Effective collaboration requires a belief that your views are worthwhile, and equal to those of others; an equal concern for self and others. Without this, it will be tempting to simply give up, and create a ‘win-lose’ situation, where you are the loser. You may find it helpful to read our page on Transactional Analysis to explore more about the position of ‘I’m OK, you’re OK’, which is fundamental to effective peer negotiation and collaboration. The ‘other side of the coin’ from self-esteem, empathy. This ensures that you are able to see others’ points of view, and put yourself in their place. With good empathy, you will come to value others as much as you value yourself, and recognise why ‘win-win’ is so important. An ability to put your point across assertively, and not aggressively. This requires an ability to accept challenges from others, and to challenge effectively and calmly when you believe that something is unfair. See our pages on Assertiveness for more. You may also find it helpful to read our pages on Anger Management, as becoming angry can prevent calm, assertive behaviour. As with so many interpersonal activities, it is impossible to collaborate effectively without being able to listen well. This means putting aside any thoughts about how you are going to respond, and simply concentrating on what the other person is saying. This includes non-verbal communication as well as the words that they are using. For more about this, see our pages on Listening Skills, Active Listening and Non-Verbal Communication. You will need to be able to ask good questions to clarify points. You need to check that you have correctly understood what someone else has said. You may also need to ask questions to clarify anything that is unclear. For more about questioning techniques, and clarification, see our pages on Questioning Skills, Types of Question, Reflecting and Clarifying. Finally, in any interpersonal situation, it is always important to reflect on what went well and less well. It is good to get into the habit of thinking about what happened, and how you could have improved on it. Developing habits of reflective practice will probably help you throughout your life, not only in peer negotiation situations. You may find yourself thinking that the term ‘peer negotiation’ is an over-academic way of describing ‘working together with other people’. This may be true, but the skills needed for effective peer negotiation will be useful throughout life. What may be even more important, however, is the mindset that everyone’s views are equally valuable, allowing you to develop a ‘win-win’ solution through collaboration. Questioning Skills | What is Charisma?